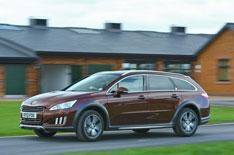 2012 Peugeot 508 RXH UK review | What Car? The Peugeot 508 RXH is the top-of-the-range model of the 508 SW. Using a version of the diesel-electric hybrid powertrain from the 3008 Hybrid4, it gives you everything from zero-emission electric-powered motoring to full-time four-wheel drive. That is thanks to its combination of a 2.0-litre diesel engine that drives the front wheels with an electric motor that drives the rear wheels. These can each work alone, or combine to give maximum acceleration and all-wheel drive. Thats not all that sets the RXH apart from lesser 508 SWs, though. It also sits on raised suspension and has a unique bodykit, including LED running lights and a restyled front end. Prices start from 33,695, and as befits the most expensive Peugeot in the UK, it comes with a lavish specification. Half-leather trim, ESP, cruise control, sat-nav, a panoramic sunroof and climate control are all standard. Whats the 2012 508 RXH like to drive? There are four separate driving modes, chosen by a rotary controller on the centre console. ZEV gives you electric-only, zero-emission motoring, as long as the batteries are sufficiently charged but for no more than a couple of miles. At the other end of the scale, 4WD does what it says on the tin: both the electric motor and diesel engine work together, powering all four wheels. In the other two modes Auto and Sport the car juggles between the two power sources to suit the conditions, with Sport giving quicker gearchanges and holding on to the revs for longer for a more sporty drive. Around town, when youll see plenty of zero-emission motoring, the system generally swaps between the various modes smoothly. The only slight irritation is that the car can be quite slow when pulling away from rest (out of junctions, for example) in electric mode; and, when the engine does kick in, it does so rather abruptly and produces a lot of noise if you demand quick acceleration. The gearchanges, too, are rather disappointing, because theres an obvious break in forward momentum while the EGC (Electronic Gearbox Control) system changes between its six gears although the help of the electric motor does means its better in this respect than other Peugeots with the same system. Once youre cruising at the legal limit on the motorway, things calm down nicely, and the system is at its best. The digital displays show you how the various power sources are being juggled, but thats the only sign of whats going on underneath. If there is a complaint, its that theres too much wind noise from around the panoramic roof. The ride, too, could be better. No matter what the speed, the suspension never seems to settle, thumping and audibly thudding its way around. Still, that does mean that the body is well controlled through bends, so its easy to maintain the speed you have managed to build up. Whats the 2012 508 RXH like inside? In almost every respect, the RXH is identical to any other 508 inside. The most major exceptions as far as the driver is concerned are the dial that shows you what the hybrid system is up to, and the controller you use to swap between the four driving modes. In terms of passenger space, though, theres no difference. With a decent range of adjustment for the drivers seat and steering wheel, most people should be able to get comfortable; in the back, too, theres plenty of space, even though theres not quite as much legroom as in, for example, a Ford Mondeo Estate. The only price you pay in practical terms for having the RXH over any other 508 SW is in the boot, where the hybrid system eats into the luggage space. The RXHs 423-litre capacity is almost 90 litres down on the regular SWs and less than youll find in the similarly priced Audi A4 Allroad. The RXH is a thoroughly impressive piece of technology, with the promise of excellent fuel economy. However, with prices that start at well over 30,000, its a very expensive car. That effectively rules it out for private buyers and, if you do want this technology, its available in the even more economical 3008 Hybrid4 for less but it does make some sense for business users. Its exempt from the 3% surcharge usually applied to diesel-engined cars, and with CO2 emissions of just 107g/km, incurs company car (BIK) tax at just 12%. Thats considerably less than any other 508 SW (although their lower list prices will compensate for that), and much less than rivals such as the A4 Allroad and Volvo XC70.